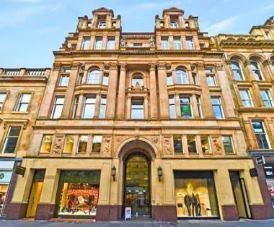 Buchanan Street office rental is located in the centre of Glasgow and is surrounded by three mainline train stations. Just north of the River Clyde, this business centre has a good range of local amenities close by including retail outlets, bars, restaurants, and department stores. The character building has been modernised inside and has some great facilities to run a company including a business lounge area and meeting rooms that can be hired hourly, half daily or for the whole day. The office suites are suitable to rent in many sizes and come complete with desks, chairs, and storage units. Telephone handsets are also included. Phone and internet packages are available and can be configured for either dedicated or shared lines. Other features at these serviced offices include disabled facilities, vehicle parking, and communal kitchen areas. There is also a professionally trained staffed reception with waiting area at the entrance to the building.